Made famous by Kim Kardashian PRP therapy or the vampire facial as it’s commonly referred to is becoming more and more popular in Dublin! However is what you’ve seen on TV true? – probably not. 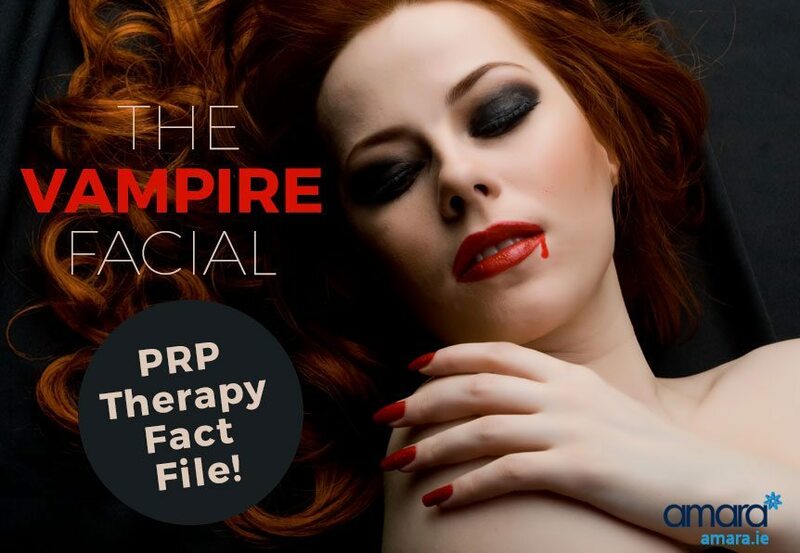 Let’s find out all about the the vampire facial PRP therapy treatment which is available now at Amara. What Is The Vampire Facial PRP Therapy? Platelet Rich Plasma (PRP) is plasma that has been separated from blood. This plasma contains growth factors that stimulate the healing of soft tissue as well as bone. PRP is a treatment that must be performed by a fully trained doctor or nurse. The vampire facial involves taking blood and then adding the plasmas extracted from that blood back into the face or whatever part of the body that the PRP is being performed on to rejuvenate the skin. PRP therapy is also known as the ‘Vampire Facial’ or the ‘Dracula Facial’ due to those Kim K photos but the procedure itself looks nothing like the photos! PRP can be performed on the face, hands and more research is even being done on PRP for hair rejuvenation (the next step from using Botox for your hair!). What Does The Vampire Facial PRP Therapy Do? The plasma that is collected from the PRP treatment contains a lot of growth promoting and healing properties which can can be used to encourage our body to rejuvenate itself. Keratin is essential to our skin! Keratin protects the outer layer of our skin from damage as well as being essential for hair and nail health. PRP also stimulates keratin to protect and heal the skin. 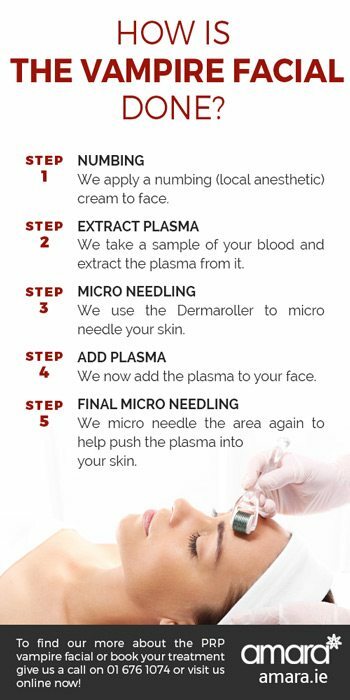 How is PRP Vampire Facial Done? There are a number of different ways the PRP vampire facial can be done. At Amara I have gone through several different techniques to find the best way. We cleanse the skin and apply a numbing (local anesthetic) cream to the face, this numbs the skin. Next we take a sample of your blood to get access to oh so good platelet rich plasma! We take the sample of your blood and place it in a centrifuge which spins the blood around at 1200 revolutions per minute. We leave it here for about 10 minutes until the plasma has separated from the blood. After the plasma has been separated we can then get to work on the skin. By now your face (or the area being treated) will be completely numb, allowing us to perform medical micro needling. Micro needling using a dermaroller creates entrances in the skin where the PRP or any serum being used can be absorbed into the skin. (Find out more about medical micro needling here). I add the plasma to the skin to be absorbed through the entrances which have been created and allow the plasma to start being absorbed by the skin. Depending on the area the PRP can also be injected directly into the skin (such as under eyes or laugh lines). We go over the skin once more with the dermaroller. This secondary micro needling pushes the plasma down into the skin to begin the tightening, brightening and rejuvenating effects of the vampire facial. How Much Is The Vampire Facial PRP Therapy in Dublin? One session of PRP is €400 while 3 sessions have the special price of €1000. We recommend multiple sessions with about a month in between to get the optimum results. Are you interested in getting a vampire facial PRP therapy at Amara? Give us a call on +353 1 676 1074 or contact us online for a consultation! Unfortunately current Warfarin users are not suitable for PRP treatment.